I was so excited when Cristina from Cristina’s Book Reviews emailed me to say that she was making the jump from a wordpress.com blog to self-hosted WordPress. Not sure about the difference? Read my FAQ! Since she was already pretty happy with the header & background from her last design, we opted for a Semi-Custom package and customized the LifeStyle theme from StudioPress. In addition to customizing the theme, I also added a few of the book blog essentials for her book reviews: custom blockquotes for her synopsis from Goodreads areas, fancy heading fonts, ratings graphics, purchase links, and two-by-two recent reviews in the sidebar. Also checkout the organized custom book reviews page that shows the book cover, title, and short intro to each of her review posts. Working with Katie has been a wonderful process, not to mention that she has the patience of an absolute saint! She took my blog and made it modern but still keeping it feminine and simple, which is exactly what I wanted. Thank you so much Cristina! I’m so proud to be considered a fairy blog-mother. Working with you has been an absolute pleasure! 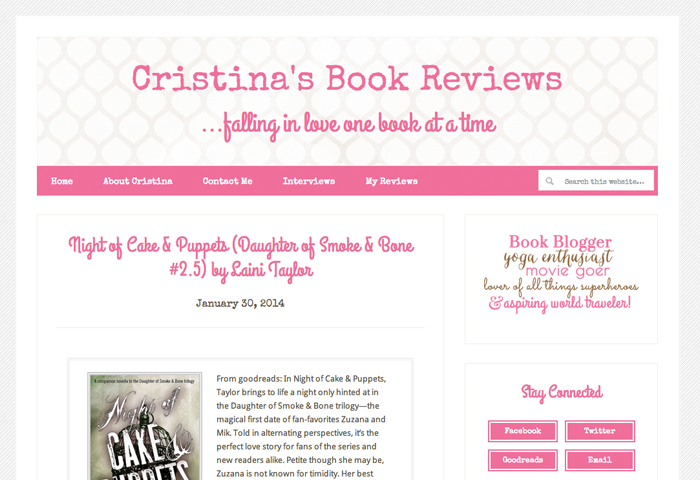 Are you interested in learning more about custom book blog design from Priceless Design Studio? Click Here!